Christmas has become over-commercialised, in the UK especially. Instead of traditional Christmas #1 pop songs being Christmassy, they are instead now whoever has won the latest talent shows. The things are the same in the video game market. There are no Christmas games whatsoever nowadays (beyond flash games & a few PC remakes). It’s obvious really, big budgets do not allow for games to be sold for one part of the year. However, it wasn’t always like this, low production costs & the Christmas spirit has made games in the past that were Christmas Classic. Here are my top 5 Games from Christmas Past. It amazing what you can get away with under the monakier of “Christmas”. And Frosty the Snowman is one of them. If it had been any other time of year, this game wouldn’t have registered anywhere on the charts. The game sucked. It was tricky to control (though I believe it was the first known platformer that used a jump button instead of up on the joystick), it requires you to be incredibly accurate with your jumping, it was unfinished (the box touted “snowballs” which never materialised) and it had a platforming no-no: the leap of faith. However, sticking it as a freebie on the front of a magazine, having a kicking soundtrack based on Frosty The Snowman & it had a two player mode made it, oh I don’t know, a little more bareable. In fact every year in my family’s household we did dust off the C64, and play it until our hearts were full. Even though if it was called something like “Gary the Marine’s Cave Run to retrieve a bomb”, we would’ve hated it, as Frosty the Snowman, it’s awesome. Every Christmas Countdown needs something that’s so over the top it’s only popular at Christmas, and this is the game. 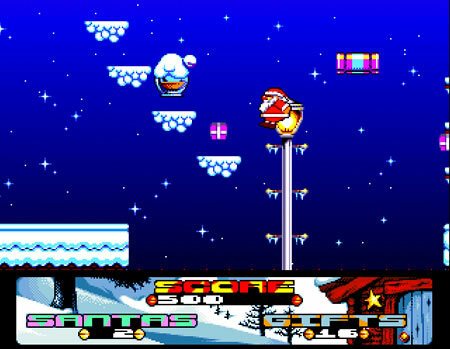 Santas Xmas Caper for the Commodore Amiga is about a undefined Christmas, where Santa’s sleigh crashes. As a result, he has to deliver all the presents by hand, avoiding killer perfumes, nasty mince pies, and toys that have turned to attack their creator.Santa must save Christmas (or Xmas, as this game loves to call it), by recovering all the presents and destroying enemies. I say destroy – the only weapon Santa has is snowballs, that freeze the enemies. Like Christmas songs, they are not memorable outside of Christmas. However, during the festive week, they display a certain air of magic. This is a solid platformer, but slightly overdoes it on the Christmas theme, hence it’s position. I mean, killer perfume bottles? Please. Some of the levels in the game were repackaged in the UK for both the Amiga & C64 to Edd The Duck – The Videogame. More sales throughout the year, but lost all of it’s charm. In short, Santa was a sellout. Not technically a Christmas game, but more of a Winter Game. This is a sequel to the game Summer Camp, where Maximus Mouse has been sent away for Christmas (the tenuous link is right there), to Winter Camp. After trying to prove himself as a camp ranger by defeating the other rangers in a skating race, an avalanche is seen to be hurtling to the camp, can the newest member of the ranger team save the day? There are 8 levels, each one completely different from the last, and it’s as tough as cheap meat. However, the game filled the “chrismassy” quota for this countdown for stage 5, where a nice little easter egg (yes, easter eggs at Christmas, I’m getting my holidays mixed up) appears, in a form of the level where you use help from Clyde Radcliffe from Creatures 2. The interaction between these two Commodore 64 Stalwarts turns this game from a fun and engrossing winter game, to a magical Christmas game. Hindsight being a wonderful thing, this game is fantastic, but it’s too damn short. 40 levels were released in all (over the space of 4 years), and featured everybody’s favourite suicidal rodents throwing themselves off the cliffs during the festive season, like always. However, instead of tunes which get stuck in your head, you have familiar tunes such as “Rudolph the Red Nose Raindeer” & “We Wish You a Merry Christmas”. 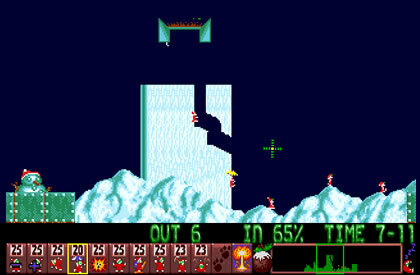 The levels are covered in snow, and violent reindeers will gore your lemmings to oblivion. It’s still the classic game underneath, and would be number one. The only thing is that it was far too short! 16 levels a year, at full price (for two years, the earlier two years the games were demos), just not quite good enough! Yes, how can anything else be #1? Probably the most famous Christmas game ever. Christmas NiGHTS was originally a demo, that became so popular that copies on ebay sell for 2 or 3 times the cost of the magazine with the demo of it. The game featured one level, originally from NiGHTS, but allowed both characters to play through it. 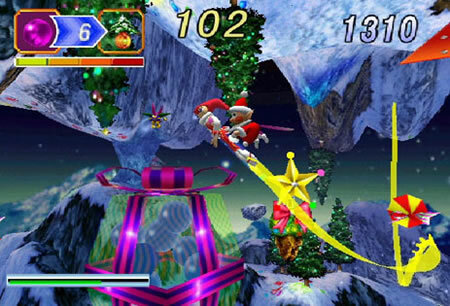 Throughout December (using the internal clock of the Sega Saturn), the game was known as Christmas NiGHTS (outside of it the demo was known as Winter NiGHTS). But the beauty was the “Christmas Presents”. Despite being only one level, you could add modifiers to it (the Christmas Presents), which you could unlock to play. There were a sizable number (I managed to unlock about 30), which allowed you change the game. And these weren’t rubbish changes or palate swaps. You had Kareoke mode where you played the game with NiGHT’s “Dreams Dreams”, and “Sonic Mode” where you can play as Sonic the Hedgehog, and the last boss was Dr. Robotnik. It was only one level, but the possibilities were endless, and Sonic Team did a wonderous job in expanding the game, and giving it away for free. As a game, it was fun and a little short, but it truly exmplified what Christmas was all about. No doubt you guys will disagree with me, if you do, please give your thoughts below! Thanks for the reviews of more C64 games. I love your story of “dusting off the Commodore 64” to play that old Frosty game! Ha!